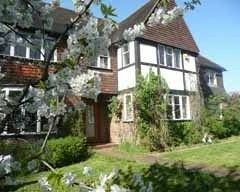 Visit Surbiton Kingston upon Thames, Greater London and the surrounding villages and stay in bed and breakfast, hotel or holiday apartment accommodation provided by BedPosts members. Surbiton, a London suburb, lies beside the River Thames. It has a 15-minute rail connection to London Waterloo. The novelist Thomas Hardy lived here as did the writer Enid Blyton. If you seek accommodation near Surbiton in Kingston upon Thames, Greater London you have come to the website of a “club” of providers who offer affordable quality accommodation around UK in hotels, bed and breakfasts, guesthouses, inns, and restaurants plus self-catering cottages and apartments .